Pretty-Wing Swallow-Wort is a twiner with leaves 5-8 x 3-4.5 cm, elliptic-oblong or linear-oblong, pointed. Leaves are heart-shaped at base, hairless, glaucous below, lateral nerves 7-9 pairs, intercostae faint; leaf-stalk up to 2 cm long. Flowers are borne in umbel-like cymes, in leaf-axils. Flower-cluster-stalks are 3-4 cm long. Flowers are small; calyx 5-partite. Flowers are white, 0.5 cm long, divided nearly to the base, petals oblong, pointed; corona of 5 erect blunt, bifid lobes, with shorter lobes between them; pollinia waxy, without pellucid margins; style conical at tip. Seed-pods are oblong-lanceshaped, 5-8 x 1-1.5 cm, with 2 wings especially prominent at tip. 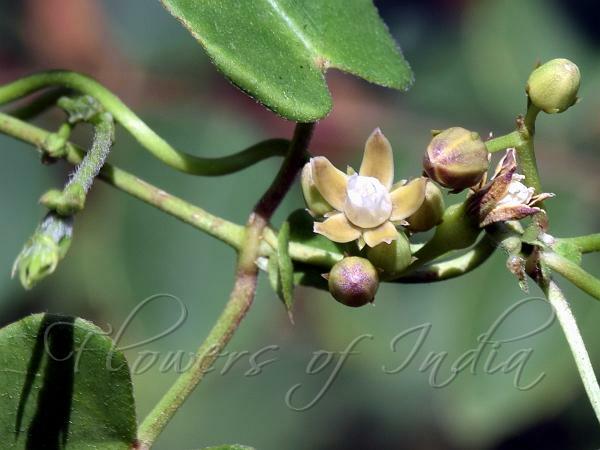 Pretty-Wing Swallow-Wort is found in India, Sri Lanka and Myanmar. Flowering: October-March. Identification credit: S. Kasim Photographed at Yelagiri Hills, Tamil Nadu & Lonavala, Maharashtra.